Hi everyone! I am participating in somewhat of a blog hop, meaning that today's project starts here and ends over at A Vintage Journey where I am guest blogging. This project all started with a vintage green frame I bought at a junk shop for $3. My frame is about 7 x 9” but really any size frame will do. Cut a piece of chipboard to fit the frame. I also pulled a piece of paper from the Correspondence Paper Stash and used it to cover the chipboard. I ripped a strip of paper to add to the left side of the chipboard (this is the just back of the main paper) and added it along side the first. A thin coat of Multi Medium was added over the entire top of the paper to seal. Then I added Frayed Burlap and Iced Spruce to the edges (remember you can always wipe it away with a wet wipe if you get too much on). Let dry. 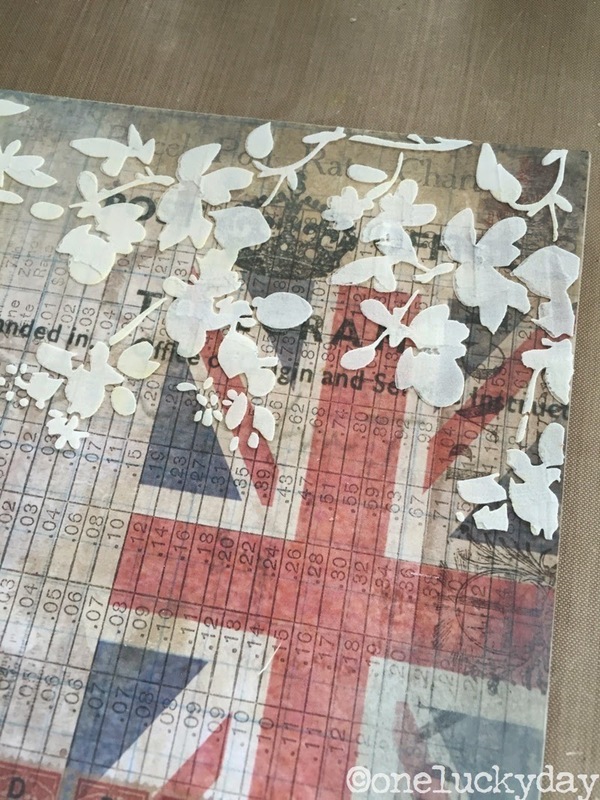 Lay the Blossom Stencil over the TOP edge of the chipboard so the blossoms look as if they are hanging down. 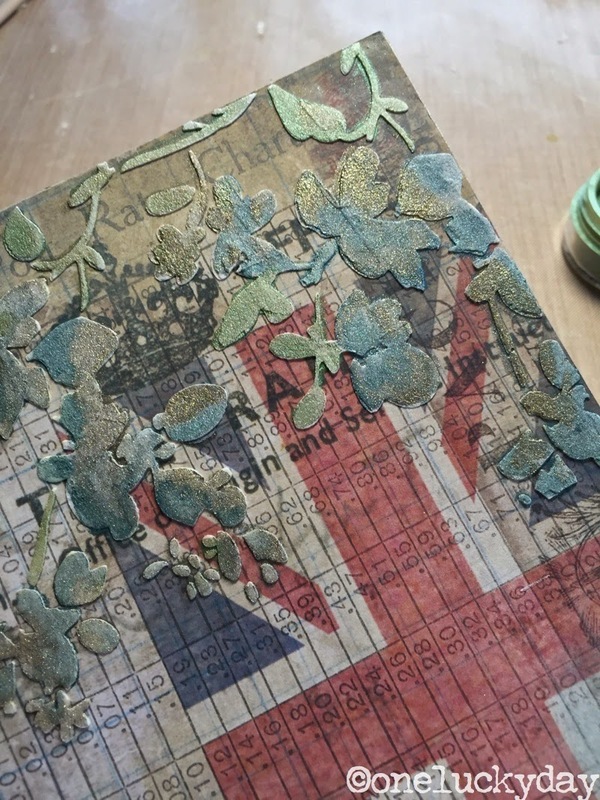 Add Ranger Texture Paste over the top of the stencil, pulling it over the stencil and into the pattern with a Pallet Knife. Lift stencil to reveal pattern. One of my absolute favorites! 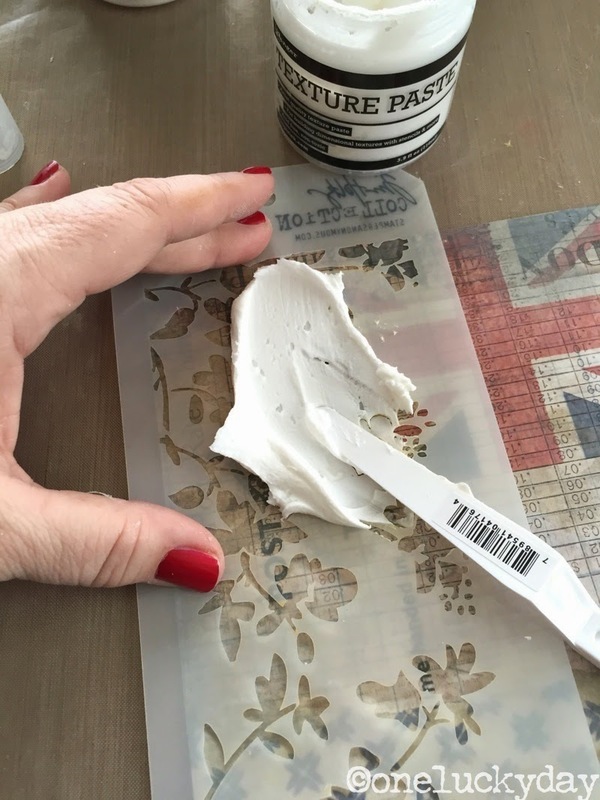 Let dry naturally (do not dry Texture Paste with a heat tool because the paste can become puffy). Once the paste is dry, paint over blossoms with Perfect Pearls. I used Blue Patina, Forever Green and my all time favorite, Heirloom Gold. Spray water onto the craft sheet. 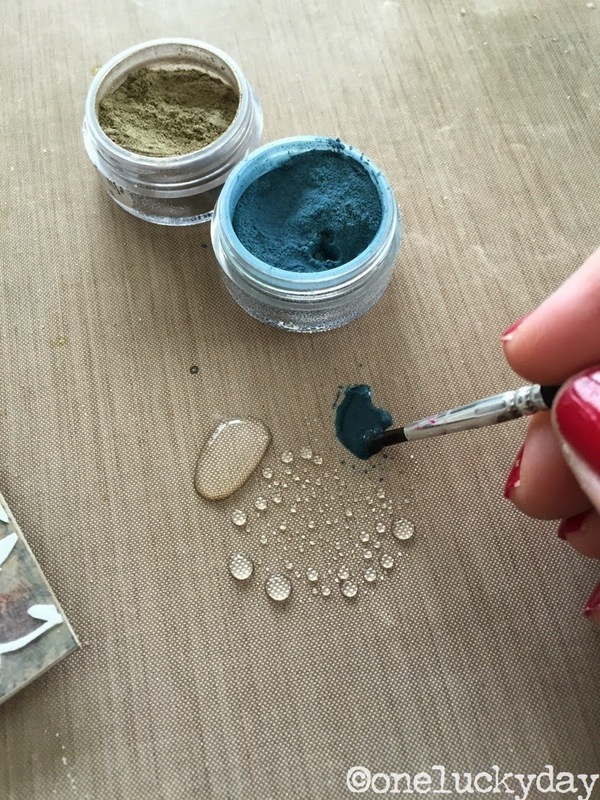 Using a small brush, add a small amount of the Perfect Pearls Powder to the water, creating a paste of sorts. Use this liquid paste to color the blossoms of the stencil pattern, creating a subtle glittery effect. Let dry. 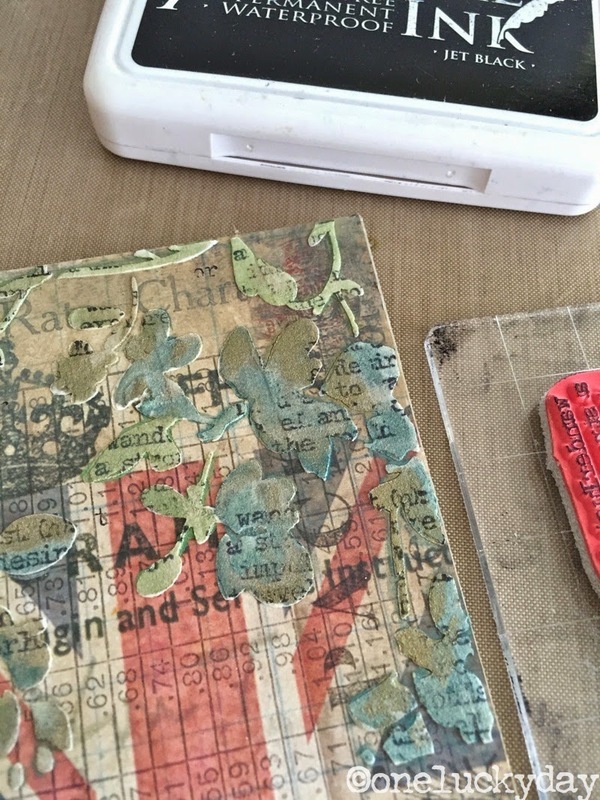 Once dry, use a small text stamp and Archival Ink to lightly stamp over the stenciled pattern. Because the texture paste is raised, the stamped image will only appear on the pattern and not on the surface below. Go over stenciled surface with a heat tool just to make sure everything is dry before proceeding with the next step. Outline the blossoms with a Gathered Twigs Distress marker. Using a q-tip, smudge the ink into the background to create a drop shadow (a bit of Multi Medium on the q-tip or finger tip helps smudge the ink really easily). 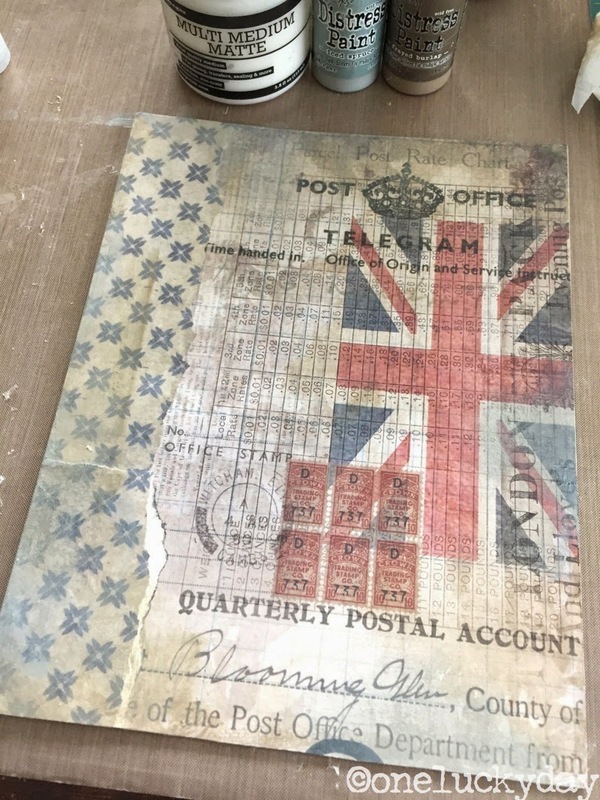 To see the rest of the tutorial and the finished project, you will need to pop on over to a Vintage Journey. See you there! thanks Shari, you are too kind for words. Like Shari I was over at AVJ first too! Great to be able to follow the whole process of this fabulous piece now! 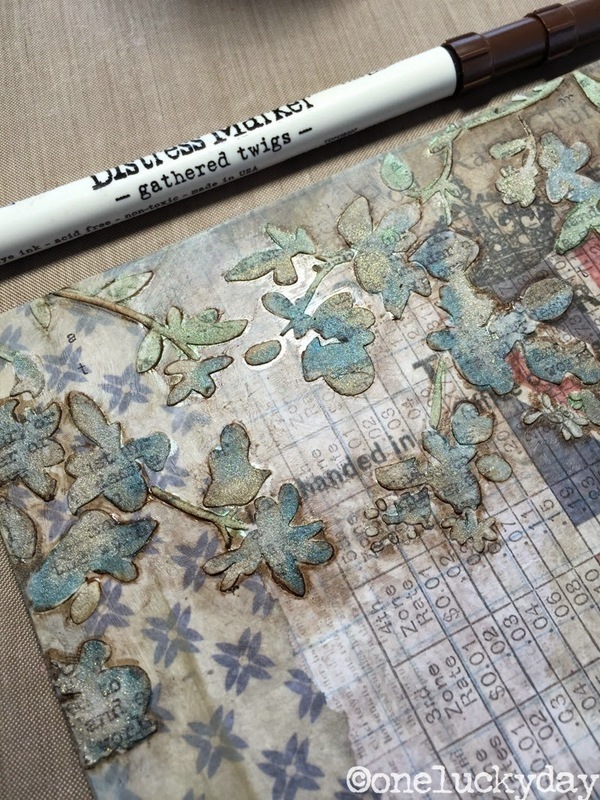 Love the idea of stamping on top of the coloured paste (such a gorgeous colour combination). Now I just need to learn to let the paste really dry naturally... Love this project and thanks for the inspiration like always!! thank you Astrid! I hate waiting for the paste to dry too! I usually end up waiting for 1/2 the time and then dry the rest of the way with a heat tool. Love the perfect pearls with the stenciling! what a great look! Love it ... you come up with the coolest ideas... ooooo perfect pearls and the alcohol ink touch on the word band...AWESOME !!! thanks Rea' I love that picture too. It was taken a year ago at Junk Bonanza in Minn. We were on the hunt for good junk! Iced Spruce is so happy you've brought her back into your life! She and I are on a first name basis now! Now I am rummaging thru my stash to find what. I. did. with my Perfect Pearls!!! SO COOL! I like the texture in this one, too!!!!! I'm headed over there now to check out the ending. What a cliff-hanger! I love it so far. I love this technique and the finished project is fabulous as always! That is absolutely lovely. Love your style. I enjoyed learning more about you in the bio. I, too, love Masterpiece and even though DA will end after next season (unless you storm the offices while in the UK) they have said a spin-off is being considered. This piece is really great and, as always, your tutorials make it seem so doable and encourage me to try it myself. Hope your trip is wonderful--be safe. 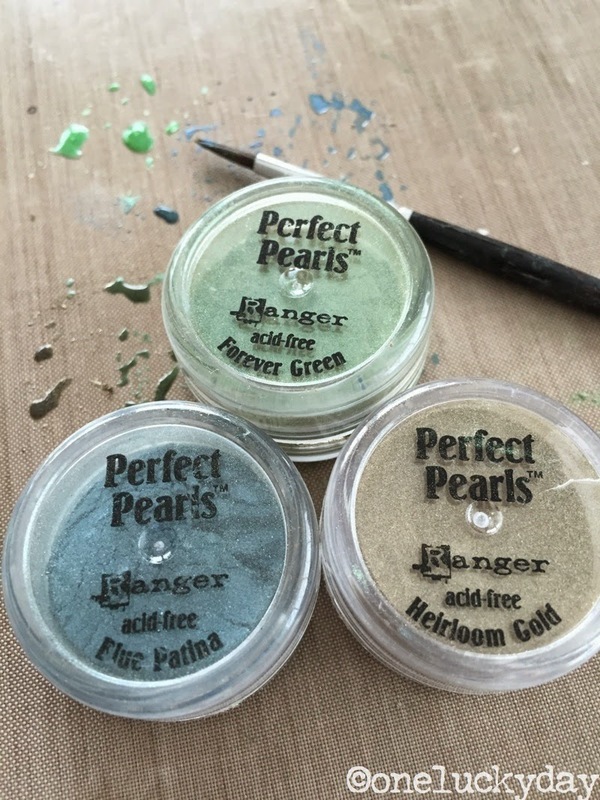 Hi Paula, I did this post back to front, but so great to see how this started and I must try my perfect pearls on the texture paste. Love the results. Thanks so much for being our Guest at AVJ today. Paula you have wowed the day with your charming vintage frame and all the ideas you have shared. Its fabulous watching the start of the process unfold here and seeing how the blossoms started off. Thank you so much for sharing your amazing talent with us at A Vintage Journey and being part of the team for our birthday challenge, we all appreciate your time and effort for us. Work of art! Have a safe trip! Absolutely gorgeous Paula, just saw your finish over at AVJ and it is wonderful! Thanks so much for the tutorial on creating your beautiful background flowers with the Perfect Pearls, just lovely. Gorgeous project Paula! Fabulous tutorial! I love using texture paste and glad to see a new method to color it.